The Fish Forever Progress Update is a regular communication to supporters and stakeholders on the key advances we're making on the ground, the challenges we're working to surmount, and the learning and adaptive management we're doing along the way. 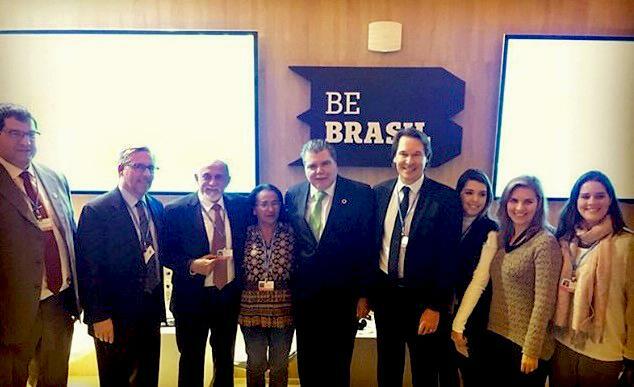 Rare President and CEO Brett Jenks joins representatives from the State of Pará, Brazilian Environmental Ministry and CONFREM for the launch of the initiativeat COP 23 in Bonn, Germany. In October, at the UNFCCC COP23 in Bonn, the Brazilian Ministry of the Environment and ICMBio, Pará state, and CONFREM launched a new initiative to protect over 625,000 hectares of mangrove forests along Brazil’s northern coast. Rare’s Brazil program is partnering with the national and state government and local communities to build capacity for effectively delivering this ambitious protection plan. Pará state in northern Brazil is the country’s region most dependent on coastal community fisheries, responsible for the largest contribution to Brazil’s small-scale fisheries catch. The joint initiative among Rare and state and federal institutions will enable more effective local governance and empower Brazil’s coastal fishing communities to better manage their coastal natural resources.Rare and CONFREM will apply Rare’s signature behavior change methodology and tools to encourage Pará’s fishing communities to adopt a managed access approach to fisheries management as well as more sustainable fishing behaviors. Particularly exciting is the potential of partnering with the local fisheries to stimulate supply chain improvements for commercially and socially important target species, such as oysters and crabs. One such project under consideration is for small-scale fishers to directly supply the Pará government with seafood for school lunches. Targeted interventions, such as this joint initiative with Brazil’s government, drive stewardship and provide incentives for effective natural resource management and decision-making among local fisheries governance and national fisheries authorities. Our Ocean 2017 Financing the Forgotten Fisheries event, moderated by Kristian Teleki, Senior Marine Adviser, Prince of Wales’s International Sustainability Unit, with panelists (from left to right): Mrs. Ulrike Haupt, Head of Environment Division, Federal Ministry for Economic Cooperation and Development (BMZ), Germany; Arni Mathiesen, Assistant Director-General, Fisheries and Aquaculture Department, FAO; Brett Jenks, Rare CEO; and Mr. Gilles van de Walle, Team Leader of the European Fisheries Areas Network (FARNET). Small-scale fisheries (SSF) across the developing world remain largely unregulated, unreported, and under-financed. Just a small fraction (0.5%) of investments from development finance institutions are earmarked for small-scale fisheries projects1. Given the direct benefits of sustainable SSF to livelihoods, food, biodiversity and resilience, Rare is capitalizing on the increased global attention towards oceans to elevate the profile of SSF and catalyze new investments into the sector – working strategically with local to international leaders, key political champions and donors such as the EU, Germany, FAO, SIDA and the GEF, who are similarly invested in the conservation and development outcomes resulting from sustainable SSF. 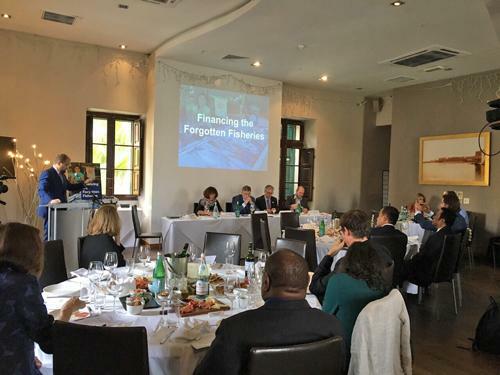 Over the past year, we have hosted and driven a series of discussions at global events to highlight SSF’s importance, most recently at the Development Finance Forum. At this forum, hosted by the German Development Bank (KfW), Rare emphasized theintegration of SSF into strategies to achieve global marine conservation targetsand the important role development finance will play in supporting these efforts. In October, at Our Ocean 2017 (hosted by the EU), we partnered with the governments of Palau and Indonesia and the FAO to highlight specific actions that the global community can take to blend not only financial resources but also organizational capacities and expertise to realize the outsized impact of supporting this sector. With over 60 attendees representing a wide range of perspectives (from government partners to NGOs, community representatives, development finance institutions, scientists and philanthropists), the discussion targeted coastal fishers’ financial needs – including basic financial literacy and access to financial services and capital required for a range of investments. In particular, Indonesia and Palau delivered powerful messages, highlighting the importance of SSF to their national development plans and emphasizing that SSF will be an important topic at Our Ocean 2018 (hosted by Indonesia) and Our Ocean 2020 (hosted by Palau). Rare reiterated our commitment to capitalize a USD 18 million Impact Fund (Meloy Fund) by October 2017 and mobilize USD 100 million by 2021 in support of sustainable SSF (the former was committed at the United Nations Ocean Conference in June). While we are encouraged by this growing momentum for SSF, the Forgotten Fisheries still need more airtime in discussions about sustainable development and ocean health. Each major international conference further solidifies our resolve and commitment to work with partners in advancing a movement for small-scale fisheries. 1. From research commissioned by Rare and completed by California Environment Associates in September 2016. Rare and the Mozambique Institute for Fisheries and Aquaculture Development (IDEPA) launched Fish Forever in six sites along Mozambique’s coast, with support from the Nordic Development Fund and the World Bank. Rare Mozambique staff recently participated in Mozambique’s first C4C (Campaigning for Conservation) 10-day hands-on training to understand how to integrate behavior change and social marketing principles into fisheries management at each site. IDEPA (now Rare) staff are now equipped to provide key community and government stakeholders with the tools to adopt a managed access and reserve (a.k.a. TURF+Reserve) approach in each site. Further, over the last few months, each of the six sites (from south to north: Matutuíne, Inharrime, Massinga, Inharasso, Memba and Mefunvo) has conducted a Fisheries Landscape Assessment and Goal-Setting (FLAGS) workshop as a critical step to implementing managed access in Mozambique. A FLAGS workshop is a two-day participatory stakeholder discussion that addresses various elements of fisheries management (fishery characterization, ecosystem threat analysis, community goal-setting, and species and habitat prioritization) and informs TURF+Reserve design and adaptive fisheries assessment and management. Each FLAGS workshop engaged over 30 participants, with attendees ranging from fishers to Fishery Community Council (CCP) members, local leaders with traditional fisheries knowledge, provincial and district government representatives, tourism operators, fish traders and academic institutions. 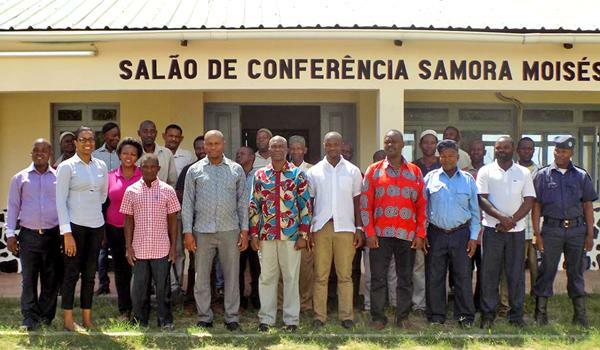 Taken together, FLAGS and C4C provide key stakeholders with the foundation needed for a participatory and integrated approach to implementing managed access in each of Mozambique’s Fish Forever sites. Testing Our Fish app in Brazil. Builds on existing behavior – Fish buyers are accustomed to recording their transaction information in traditional logbooks. OurFish digitizes this process for them. Reduces the amount of training by orders of magnitude – each buyer can collect data from groups of individuals; fishers no longer need to be individually trained to collect catch data. Develops business intelligence for fish buyers – analyzing individual purchasing history can help fishers manage their business and provides an incentive for sustained use. Provides income history to fishers – which is a key component of accessing formal financial services. Delivers instant data analysis – cloud computing and automated analytics enables data to be processed, collated and shared instantly – from an individual, to a community management unit, to the national government. Builds opportunity to join the formal economy and make small businesses investment ready – through cash flow, profit histories and links to the digital market place. 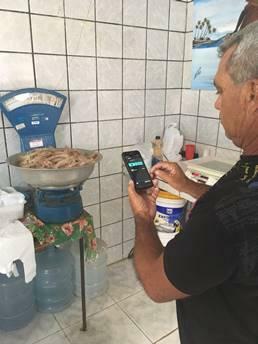 To access OurFish benefits, Brazil’s fishers must register to receive an identification card that contains a QR code scanned by the app. Fish Forever Brazil’s goal is to register all fishers working in new sites in Pará and Pernambuco. Globally, OurFish was launched in 2015, with proven adoption in Belize and Honduras (with national government support) and Myanmar (with regional government support). Pilots have been since launched in Palau, Philippines, and Panama, and Fish Forever plans to roll the platform out to Indonesia, Mozambique and Mexico starting in 2018. A Savings Club at work in Tinambac, Philippines. As reported in Issue #8 (March 2017), village savings and loans clubs (a.k.a. savings clubs) provide fishing households with an opportunity to build equity and social capital and lessen their dependence on high-interest loans (reducing household vulnerability to external shocks and crises). 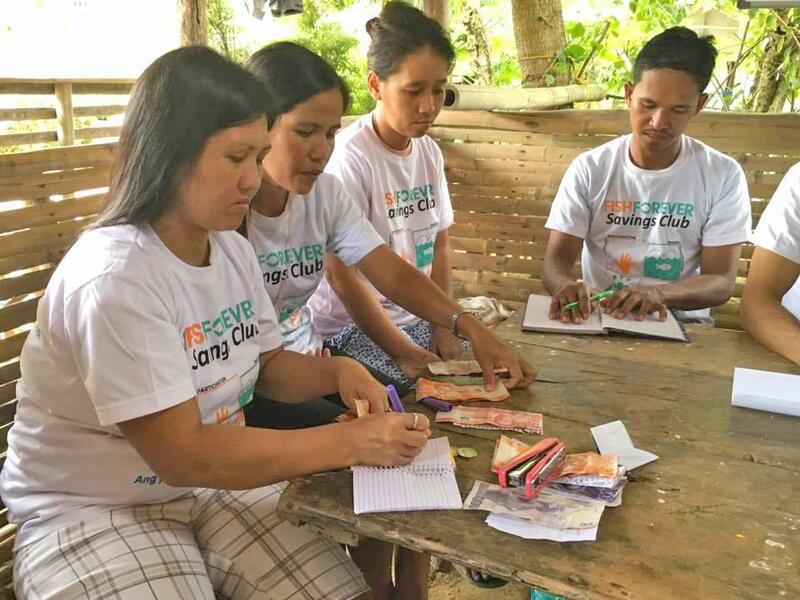 Since the inception of Fish Forever’s “savings clubs” in the Philippines (October 2016), 33 barangays (i.e., villages) have formed 70 clubs (1,476 active members, over 74% of which are women), collectively saving over USD 113,000. These savings clubs – as well as the community enterprises they can engender, such as drying and selling fish in local or domestic markets – provide a transformative opportunity to help fishing communities build and retain wealth. Community enterprises – wholly-owned and managed by the fisher households – stem from the social and economic equity created from the clubs. These enterprises not only provide a new source of economic stability for the fishing community, but they enhance compliance and support for local enforcement (i.e., harvest and gear restrictions) within managed access and reserve areas given the incentive to protect the resources that provide income (i.e., fish). Underpinning the savings clubs’ success is a core behavioral science principle: the ability for fishers to see, fairly quickly, the results of adopting new responsible behaviors (‘proof of impact’): by both creating and then accessing savings, members realize that retaining wealth and controlling their finances is possible, and visualize how long-term planning is vital for sustaining individual household wealth and the community’s natural resource. This realization drives the necessary community engagement and local buy-in needed to support the critical early stages of club formation. The remarkable popularity of and reception to these clubs by Philippine fishing households has created powerful momentum to reproduce this success across coastal fishing communities in Mozambique, Indonesia, and Brazil, among others. Fish Forever is currently exploring how to capitalize on the clubs’ success and further integrate financial inclusion of coastal fishing communities into the Fish Forever approach. Locally farmed clams in Toba City. 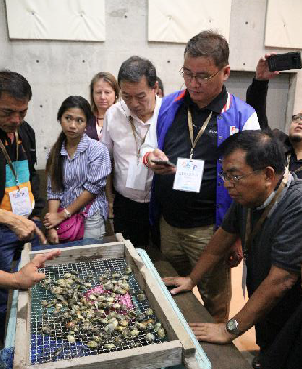 In late September, Rare Philippines led a Fish Forever delegation to Japan’s Mie Prefecture to gather insights from Japan’s Common Fishing Rights System. The visit, which compared Japan’s advanced small-scale fisheries governance framework with the Philippines’ expanding approach to marine tenure and preference, highlighted two important commonalities of the respective approaches: the importance of empowering fishers with the decision-making authority over their fisheries, and the critical role of cooperation for sustainable resource use. In Japan, each Fishery Cooperative Association (FCA) determines how to distribute its allocated fishing rights and revenues among its members. For example, in Wagu (a Japanese FCA in Mie Prefecture), revenue-sharing pooling arrangements among fishers have led to decreased fishing efforts and higher profits. The visit reinforced that, in addition to these economic drivers, the right mix of conditions, cultural antecedents and other social factors also drive such cooperation. For example, a sense of belonging (related to accessing a resource) can define a willingness to cooperate, especially under stressful conditions, such as resource scarcity. In the case of the Wagu FCA, scarcity in fishing areas drove development of the pooling system. Learning that Japanese fishers credit management authority and cooperation—as well as experimentation (e.g., oyster and clam farming); technology (e.g., mechanization), and innovation (e.g., coordinating and pooling harvests)—with fishers’ ability to diversify their incomes and drive efficiency has inspired the team to compare how Fish Forever is employing similar tactics in current and future countries of operation. In the Philippines and Indonesia, fishers are developing and/or exploring the formation of savings clubs to pool investments; in Mozambique and Brazil, fishers are trialing OurFish to improve data collection efforts; and in Brazil, fishers are exploring enterprise development through oyster cultivation. Visits with the Philippine Ambassador to Japan, Jose C. Laurel V, the Nippon and Peace Boat Foundations, various Fishing Cooperative Associations, and others helped to solidify the platform for future collaboration and exchange on small-scale fishery governance and management between the two archipelagic nations. 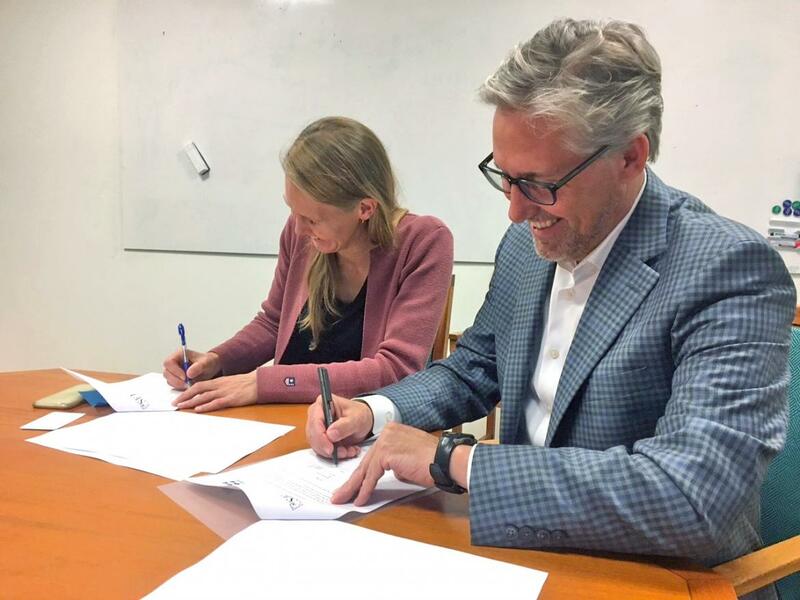 Rare President and CEO Brett Jenks and SEI’s Center Director Louise Karlberg signing the MOU. In October, Rare and the Stockholm Environment Institute (SEI) convened a select group of 50 practitioners, researchers, donors and policy-makers to discuss how behavioral insights can influence development and environmental research and policy. The Behavioral Insights in Environment and Development Summit, Oct 26-27 in Stockholm, Sweden offered an informal and participatory platform for attendees – including the United Nations’ Food and Agriculture Organization, the Stockholm School of Economics, the Swedish Ministry of Environment, the KR Foundation, the Gordon and Betty Moore Foundation, the Helmhotz-Centre for Environmental Research, OECD, the World Resources Institute’s Better Buying Lab, Climate Focus, research4impact, and University of Pennsylvania’s Social Norms Group, among others – to share behavioral insights and explore synergies and partnerships in advancing behavior-centered research, design and practice. Amidst stimulating keynotes, workshops and ‘deep dive’ sessions, the UK’s Behavioural Insights Team (BIT) Senior Advisor, Toby Park, led attendees through the practice of designing behavioral insights-driven interventions to address challenges ranging from electronic waste to dietary choices. Co-hosts Rare and SEI presented a case study on applying a behavior-centered design framework to small-scale fishing challenges in Tinambac, Camarines Sur, Philippines. Further, SEI’s Behavior & Choice Initiative team led the diverse group through a user-journey mapping workshop to create a shared vision for the future of this small but growing behavioral insights network. This partnership is one of a number of new collaborations, spurred by Rare’s Center for Behavior & the Environment, to help bridge the gap between thought leaders in behavior change research and field-based practitioners. To stay up-to date on this and other initiatives or the Center, sign up here. Fish Forever: A solution to inspire and accelerate community, and then national, adoption of spatial, rights-based management systems, combined with marine reserves, by leveraging Pride – Rare’s proprietary, proven behavior change methodology. ; and 20% of this rights-based fisheries management system is fully protected as a reserve. Under the Vibrant Oceans Initiative, Bloomberg Philanthropies supports Rare’s coastal fishery reform work in Brazil and the Philippines.